Looking for a curried shrimp recipe and you stumbled in here, a BBQ website? Wait! don't leave yet, this recipe really deserves a place among the best shrimp curry recipes out there. Green curry paste and medium curry powder combine with limes and coconut milk to make this a Thai dish that's fantastic served with jasmine rice. 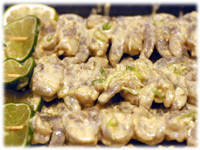 What really sets this recipe apart from many of the others is how the limes are used, both in the shrimp marinade as well as on the kebabs. Grill the marinated kebabs over high heat and then drizzle some of the reserved curry lime coconut blend over them and the rice when cooked. 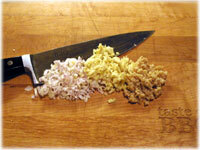 Chop the lemongrass, garlic and ginger and place in a food processor or blender. 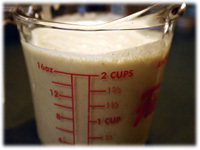 Add the coconut milk, lime juice, green curry paste, medium curry powder and brown sugar. This should yield about 2 cups of the curry mixture. Stir in the 2 tablespoons of chopped green onion. Soak 6 - 8 bamboo skewers in water for an hour. 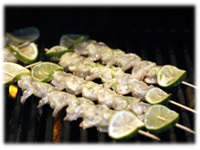 Thread 5 - 6 shrimp on each skewer with a slice of lime on each end to hold them in place. 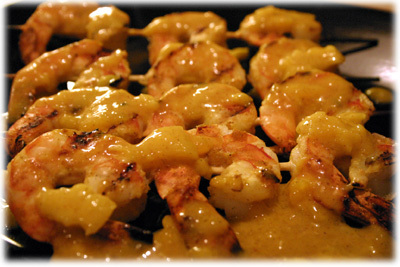 Sprinkle a little curry powder over the shrimp on both sides. 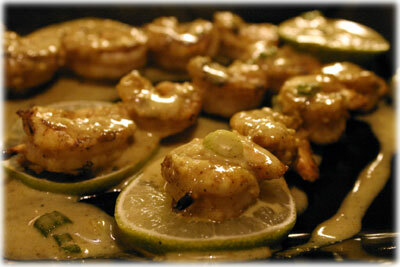 Pour 1 cup of the blended curry recipe marinade over top of the shrimp and reserve the rest for drizzling later. 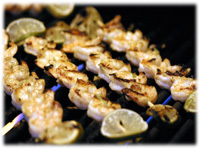 Turn the shrimp kebabs several times to ensure they're evenly covered. Cover with plastic wrap and refrigerate at least 60 minutes. Clean and oil the grates and preheat the grill to 575F - 600F. While the grill is heating prepare the rice and set aside. 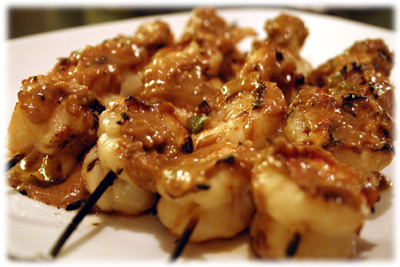 When the BBQ has reached cooking temperature place the curry shrimp kebabs on the grates and close the lid. After 3 - 4 minutes flip the kebabs. They should be browning nicely and turning opaque. If they stick just give them a wee wiggle with your tongs to loosen them from the grates. 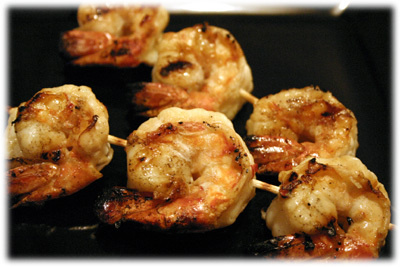 After another 3 or 4 minutes longer, the shrimp should be cooked and can be removed. Microwave the reserved curry marinade for 30 second or so just to warm it up. 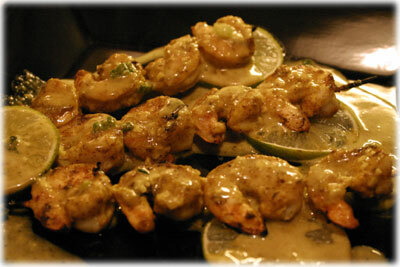 Place a skewer or two over the rice and drizzle some of the reserved curry marinade over the shrimp and rice.